Black Plastic Gyre Necklace Boa is constructed from post-consumer black plastic waste from take-out containers, serving bowls, roast chicken trays, bottle caps, pen caps, black plastic straws, deli containers, nail polish caps, yogurt lids, and anything made from black plastic. The ends of the necklace may look like a “jewelry catch” but they are actually black plastic spools from CDs. Monofilament. Plastic is cut by hand, drilled, and threaded. The Black Plastic Gyre Necklace Boa is 9" ht x 14" wide x 26' long. At the end of February 2018 I finished making a 26 foot long necklace out of black plastic post-consumer packaging as a artwork intended to bring awareness to the plastic waste in our oceans. 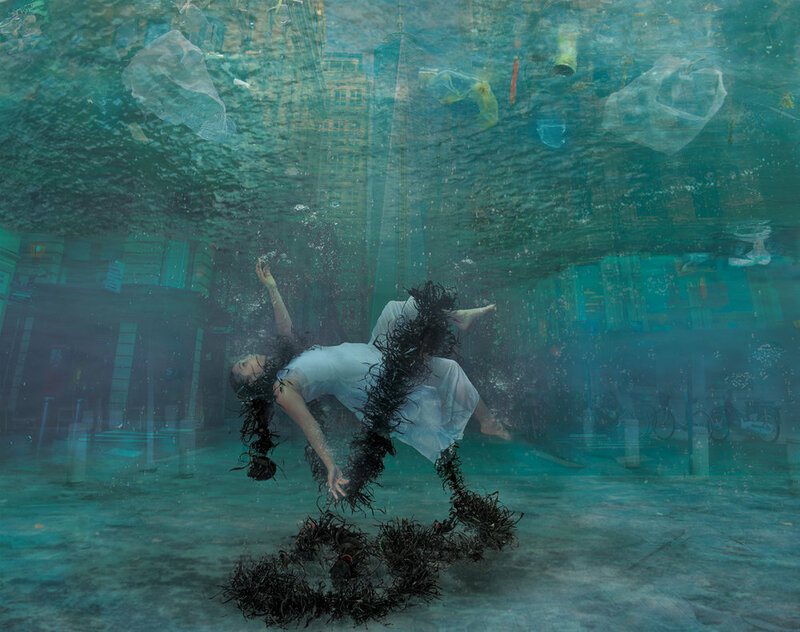 In the photo below, the model wears the Black Plastic Gyre Necklace suffocating, submerged, drowning in plastic waste. In the background of the photo, a cityscape is submerged while plastic floats in the water. This photo is a collaborate effort. Everyone was willing to experiment and support my vision for the idea. I made the necklace first. During the photo shoot, I discussed this idea with both the model and my photographer Philip Cohen. They were willing to experiment with me without any concrete goal or pre-condition that it would be a success.. Then my daughter Aryn Shelander created the Photoshop fabrication of this idea through several iterations. Without everyone working toward an abstract vision of this idea, it would not have happened. I'd like to express my appreciation for their support. The Black Plastic Gyre Necklace was photographed on a plain white paper background, on a mannequin, on the model and finally in an act of creativity in a imaginary photograph which you can see above. Click on the links or these photos to read the post on ASK Harriete where I show the deliberation about each photographic image. Photo Credit for above images: Philip Cohen for plain white background, mannequin and model. Underwater photo creation Aryn Shelander using model shot by Philip Cohen. Model Jen Ohara. 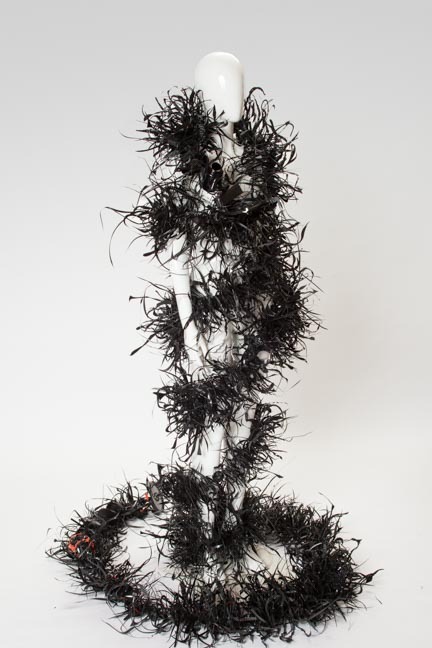 The Black Plastic Gyre Necklace will be shown in the upcoming exhibition Uneasy Beauty at the Fuller Craft Museum. The . exhibition opening date is Saturday October 6, 2018. The date of the Opening Reception is Saturday October 13th from 4 – 7pm. I will be there! This evening event will include a curator’s lecture by guest curator Suzanne Ramljak. I will be there! This evening event will include a curator’s lecture by guest curator Suzanne Ramljak. Scroll down this page to learn more about the assembly of this exhibition piece and the impact of plastic waste on our oceans and the earth. In this photo (below), you can see me assembling the necklace at about the half way point. The Black Plastic Gyre Necklace was assembled in sections, and then the sections were tied together. The shorter sections could facilitate the threading. The sections are also a practical insurance that it will never completely come apart if one set of the mono-filament threads broke. In the next image (below) my husband Bill is using his extensive Eagle Scout knot knowledge to tie the individual lengths together. Plastic is everywhere. No matter where you go, you see plastic blown into bushes and plastic debris. There are five gigantic gyres of plastic in our oceans. Plastic is breaking into micro-particles eaten by marine animals and fish. The sheer volume of plastic trash now littering Earth has become impossible to ignore. It's time for environmentalists, policymakers and elected officials to start planning a broader response: phasing out all single-use plastic, not just the most pernicious. The United Nations has just announced The Ocean Conference with the objective to prevent and reduce the quantity of plastic in our oceans and seas. Watch the program "Piling up: Drowning in a sea of plastic" from CBS Sunday Morning. "70 percent of our discarded plastic winds up in open dumps or landfills." "Every single year, somewhere between 5 and 12 million metric tons of plastic waste enters the ocean,..."
I wondered how plastic got to the oceans until I looked at the streets. All of these objects shown here were laying in the street on my path to the gym. For day after day I walked past them saying, "I will take a photo of them after class." Each day they inched closer to the storm sewer on their own. Driven over by cars, they were crushed and dirty, but still whole. Thank goodness there was no rain. Finally, I stopped, photographed their path to the storm sewer. If they were washed into the storm sewer, they would go directly to the San Francisco Bay and out into the ocean contribution to the gigantic volumes of plastic waste in our oceans. This is what the Black Plastic Gyre Necklace is all about. For your information I carried the black plastic take-out tray to the trash. The tray was too broken and dirty to use. Black plastic is not recyclable. The marker cap and spoon, I carried home, washed and incorporated into the Black Plastic Gyre Necklace. Plastic does not degrade. Instead, it breaks into micro-particles eaten by the marine animals and fish. 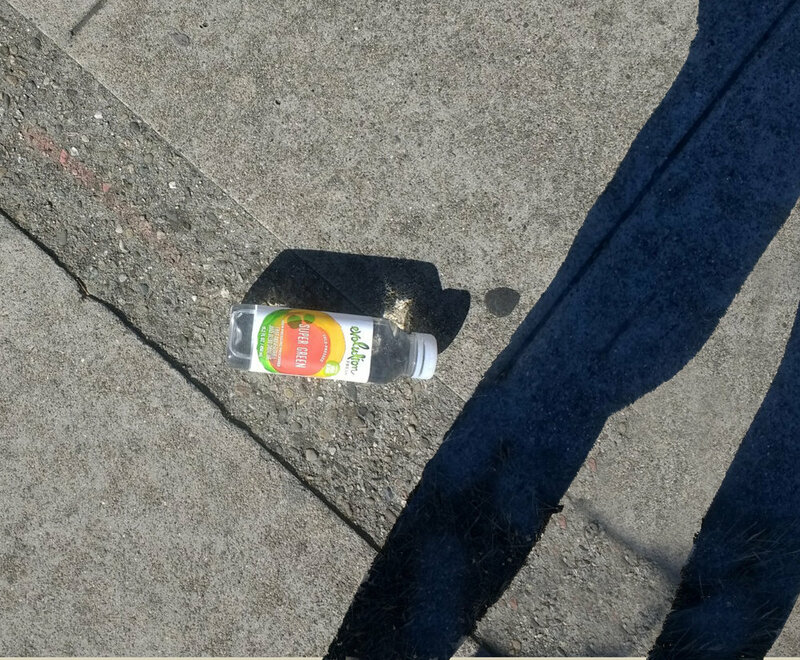 This Super Green plastic bottle was laying on the sidewalk. There is nothing green about plastic. Check out this post "I See Plastic - Everywhere" on ASK Harriete. At the bottom of the post, I continue to document the plastic I find on one block of 43rd Avenue in San Mateo, California. I used to wonder how the plastic landed in the ocean. Now I see how. I collected post consumer black plastic waste for a Black Plastic Gyre Necklace for years, but my accumulation was slow. I avoid all purchases with black plastic, if possible. When the eight week project started, I needed more black plastic fast. Many people saw my posts on social media for black plastic takeout trays, bottle caps, pen caps, black plastic straws, deli containers, nail polish caps, yogurt lids, or anything else made from black plastic. I am very grateful for all the contributions. Read the post Assistants, Assistance and Generosity to Complete the Black Plastic Gyre Necklace for an evolving list of people who helped make this possible. Above photo is one black take tray from a rotisserie chicken and the plastic shapes that I cut from this tray. Are you aware that chemicals in plastic leech into your food. Your body absorbs the plastic chemicals as hormones causing fertility problems. Food that is heated in plastic is even more vulnerable to absorbing plastic chemicals. Never heat your food in plastic even if it says "microwave safe." A black plastic lid from Nosa Yogurt was cut into multiple parts for my Black Plastic Gyre Necklace. This is about the impact of plastic in our oceans. More specifically, black plastic is bad, very bad and not recyclable (despite that it has a recycle number.) At automated recycling centers, plastic is sorted by optical scanners which use the reflection of light to identify the types of plastics. Black plastic doesn’t reflect light, so can not be seen and sorted by the optical scanners. 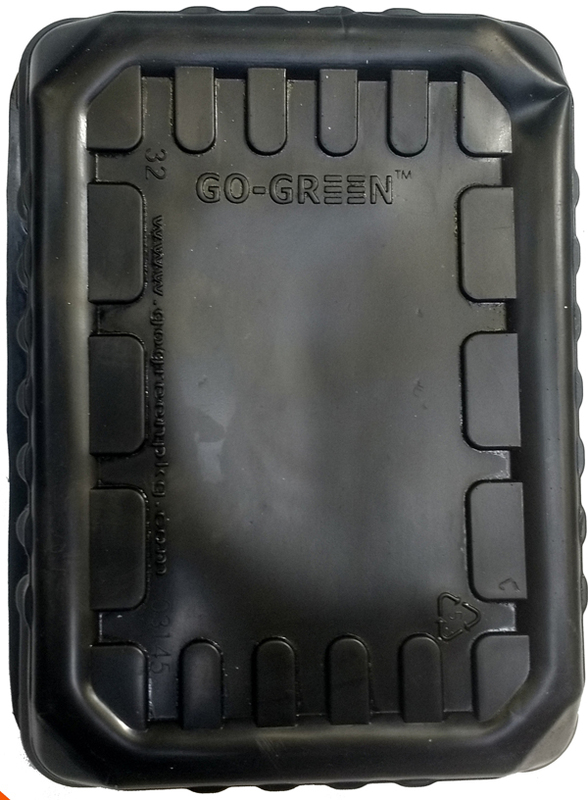 GO-GREEN black plastic container (left) is not "green" in any way. This is a prime example of green washing. Black plastic is not good for the environment. Plastic is a petroleum base product which has huge environmental issues in itself. Add the fact that most black plastic is not recycled even though it has a recycle number on it. This container was used to sell Brussel Spouts Half-Cut from Trader's Joe's. Rather ironic don't you think buying green vegetables in black plastic? In the photo above, I cut up the GO-GREEN black plastic into pieces for a black plastic gyre necklace boa. 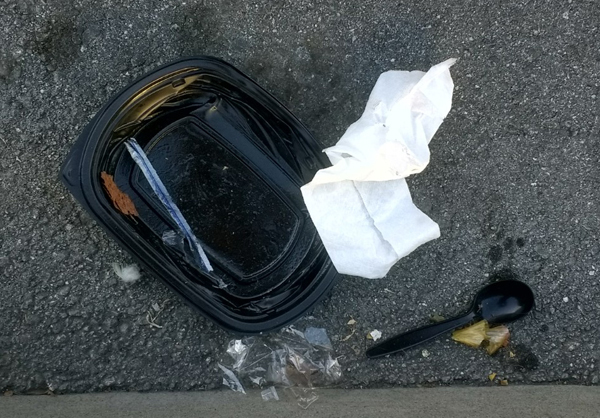 Above photo shows a black plastic takeout container for Japanese takeout. The shape of each black plastic container seems to generate a unique vocabulary of forms for the Black Plastic Gyre Necklace. I cut plastic for hours every day on a eight week marathon to get this Black Plastic Gyre Necklace done in time. Each container inspires a different vocabulary of shapes. This Black RECYCLE Bracelet emerges from post consumer plastic discards of coffee cup lids, take out trays, and packaging. The volume of single use containers darkens our future, polluting our landfills, oceans, and waterways. Black plastic is the worst offender. It can not be recycled, reused or re-purposed. It does not degrade, but instead breaks down into micro particles eaten by fish and animals further increasing human exposure to plastic in our food. This one of kind bracelet is easy to wear despite its dark and threatening appearance. The cut plastic is soft, durable and tough. Recycle bracelet constructed from post consumer recycled plastic is from the Recycle Collection. Button catch with loop closure is very secure.